We are fortunate to enjoy the plentiful great fruits and vegetables Maui offers. 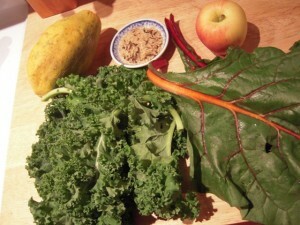 I often tell my clients to lose weight eat as much fiber as you can safely digest. Or when filling your plate, imagine your plate like a clock. From 12pm to 6pm, is a field of greens and other delicious vegetables. Fiber is a virtually indigestible substance that is found mainly in the outer layers of plants. Fiber is a special type of carbohydrate that passes through the human digestive system virtually unchanged, without being broken down into nutrients. Fiber is the part of plant-based foods that our bodies can’t easily digest. It passes through our digestive tract without providing nutrition or calories, and yet it is healthy and acts as a good scrubber. Fiber helps to keep us regular ward off certain diseases and can also reduce our risk to colon cancer. Fiber also helps cholesterol to exit the body therefore reducing the risk of heart disease. Fiber makes us feel full sooner and stays in our stomach longer than other substances we eat, slowing down our rate of digestion and keeping us feeling full longer. Due to its greater fiber content, a single serving of whole grain bread can be more filling than two servings of white bread. Fiber also moves fat through our digestive system faster so that less of it is absorbed. Products labeled “whole grain” are made with the complete grain kernel, whether the grain remains intact as in oatmeal or it is ground to make bread, pasta or cereal. Watch out for labels that read, “100% wheat” or “multi-grain” or coloring added. Most wheat bread is almost identical to white bread except that caramel coloring has been added to make it look more natural. Refined grains like white rice and those used to make white bread and sugary breakfast cereals have lost most of their fiber and nutrients. They turn into blood sugar (glucose) so fast and may cause a spike in your insulin level. This signals our body that plenty of energy is readily available and that it should stop burning fat and start storing it. We know that an insulin spike is followed by a drop in insulin level that leaves us feeling tired and hungry and wanting to eat more. The unfortunate result of this event is that it makes us want to eat something else with high sugar content. Fiber helps keep our blood sugar at a more consistent level. Adding more fiber to your diet will likely help you lose weight and improve your health. Start adding more slowly to see how you tolerate it. Of course, regular exercise and plenty of fluids will also assist you in your weight loss efforts. To help me stay in shape and eat healthy I make sure I get enough veggies and fruits, so I have them delivered each week to my home. I love the service Kula Fields offers and that I know I’m getting what my body needs. Now I have no excuses to eat well! I make delicious smoothies with young coconut milk and Sambazon Acai Antioxidant Superfood Organic Puree and all the fruits I can find. Remember, take it slow on introducing more fiber. I promise you will see a great change in your body and feel great too.